"NEW YORK TIMES" BESTSELLER "The Jedi have struck a blow against tyranny. Can they strike down ultimate evil?"" " Chief of State Natasi Daala has been overthrown, and the Jedi Order has taken control of the Galactic Alliance. But while the new governors dismantle Daala's draconian regime, forces still loyal to the deposed official are mobilizing a counterstrike. 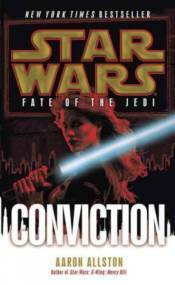 And even the Jedi's new authority may not be enough to save Tahiri Veila, the former Jedi Knight and onetime Sith apprentice convicted of treason for the killing of Galactic Alliance officer Gilad Pellaeon. Meanwhile, Luke and Ben Skywalker are relentlessly pursuing Abeloth, the powerful dark-side entity bent on ruling the galaxy. But as they corner their monstrous quarry on the planet Nam Chorios, the two lone Jedi must also face the fury of the Sith death squadron bearing down on them. And when Abeloth turns the tables with an insidious ambush, the Skywalkers' quest threatens to become a suicide mission.